Outside my window... Sunny 36 degrees in Indianapolis. I am thinking... how great it has been to be with our extended family and friends these past few weeks. I am thankful for... alone time with my son. I am wearing... black sleeveless top, green cardigan, jeans. I am going... nowhere. Nathaniel and I already went to JoAnn this morning since we don't have one in Monterey. I am hoping/praying... our trip back to California this Saturday is stree- and cry-free! I am hearing... Nathaniel making raspberry noises in front of my mom's dog. Around the house... two cats and one dog; Nathaniel loves being surrounded with so many animals! One of my favorite things... warm brownie with a scoop of ice cream. I made some last night for dessert. I enjoyed time with extended family over the holidays too. Such a blessing. “Nowhere” is one of my favorite places to go. I love staying at home. :-) Now I’m humming “Let Me Live” in my head. A good song! Such a cute picture. I love when they pretend to do big people things. It's so cold there! That sounds like an absolutely perfect week : ) Seriously! Have fun with your family! Glad you are enjoying time with your family! sounds like a fantastic time with your family..enjoy! 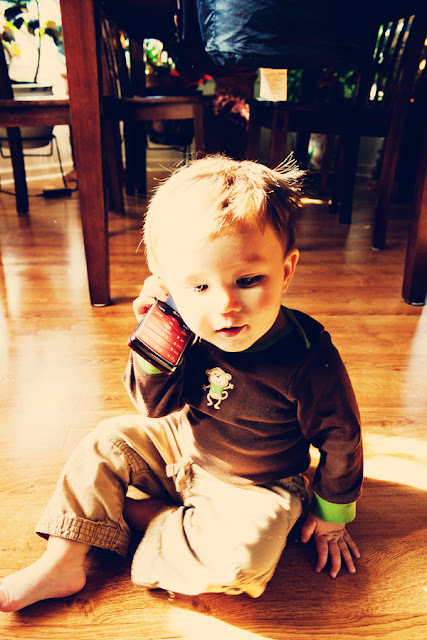 Isn't it funny how early they learn what a phone is? !